Schiller Park, IL - Braner/Loopco, a designer and manufacturer of high production coil processing lines announces the availability of a coil slitter that completely eliminates manually installed slitter knives and spacers. The new "Programmable Slitter" automatically positions rotary slitter knives along the width of a coil to produce multiple slit widths according to parameters entered into an industrial duty PLC controller. No Hands Set-Up: The new Programmable Slitter replaces the traditional slitter arbors and associated slitter knives and spacers or "hub" knives in favor of multiple independently positioned precision "slitter heads", with each slitter head fitted with upper and lower slitter knives and rubber stripping rings. The slitter heads are supported on a precision-machined base with each head independently power positioned according to the desired slit width and hydraulically locked in place. 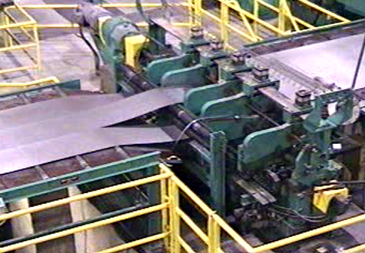 Slitter head positioning is automatically accomplished without any manual intervention. Vertical and horizontal clearances are established according to material gauge and shear strength. Quick Tooling Replacement: The slitter knives and stripping rings are mounted on large diameter hardened and keyed stub arbors that rotate in precision machine tool bearings. Arbor runout is less than .00020", allowing for precision tolerance slitting. The knives and stripping rings are secured on the stub arbors with a simple locking nut that allows the tooling to be removed and replaced in a matter of minutes without disassembling the slitter heads or repositioning the heads to a special knife replacement location. Driven Slitter Heads: All slitter heads are driven by a common DC motor and gear reducer drive train for slitting and threading purposes. Maximum slitting speed is 1,000 FPM. 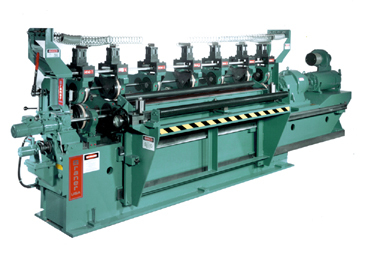 Application: The Programmable Slitter is suitable for use in coil-to-coil slitting and side trimming lines as well as multi-blanking lines where short runs are common and slitter set-up time effects productivity.